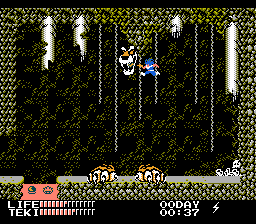 NES Spelunker II: Yūsha e no Chōsen (JPN) in 15:12.05 by ventuz. The beautiful Fairy Land has been ruled by the evil demon Geyla for a thousand years. You are a nameless spelunker who is searching for treasure. You are told to defeat Geyla and to free the Fairy Land. But you are unsure about your motivation. Do you really wish to save the world, or are you just interested in all those treasures buried deep in mountain caves? You have a special meter called Toku that will indicate exactly how much you are interested in saving the world, and how much in grabbing treasures. Your actions will influence the outcome of the story. In Spelunker 2, there are 3 characters to pick from, each has different weapons and ability. In this TAS, the character Esper is used to complete the game in 15 minutes 12 seconds using ESP (set and warp to teleport point).